First take the lowball glass and rub the rim with a lemon slice, then dip it into bar sugar to frost the rim. 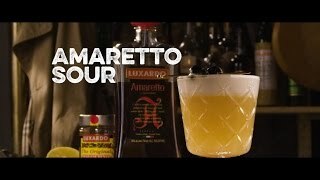 Shake the amaretto and lemon juice together with ice until the shakers outside is frosted, then strain into a lowball glass with ice. Garnish with an orange slice or maraschino cherry. 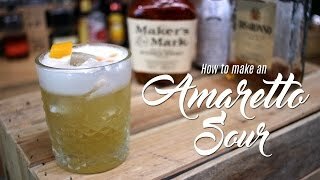 This is the classic Amaretto Sour recipe, variations include using sugar syrup / bar syrup for a sweeter taste, or even egg white in some cases. 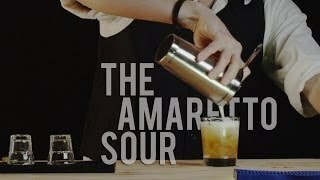 As with all good cocktails, try the recipe to get a feel for what you are trying to create.